Children with unilateral cerebral palsy spend hours practicing bimanual daily activities to work on using both hands together. Recent research indicates that the child’s interests influence the success of bimanual daily activities. The study included 20 children (8-14 years old) with unilateral spastic cerebral palsy. Hand use was investigated with videotaping of bimanual daily activities. Each child identified bimanual activities of their interest and no interest. Videos were then coded based on the affected extremity’s forms and effectiveness of use, caregiver provision and types of assistance, and child’s satisfaction. After analyzing 116 activities, the researchers discovered that children demonstrated longer periods of satisfaction performing activities of their interest. In addition, caregiver physical assistance was provided for longer periods of time in activities of no interest. The researchers concluded that children require less physical assistance and increased periods of satisfaction when they are interested in bimanual daily activities. 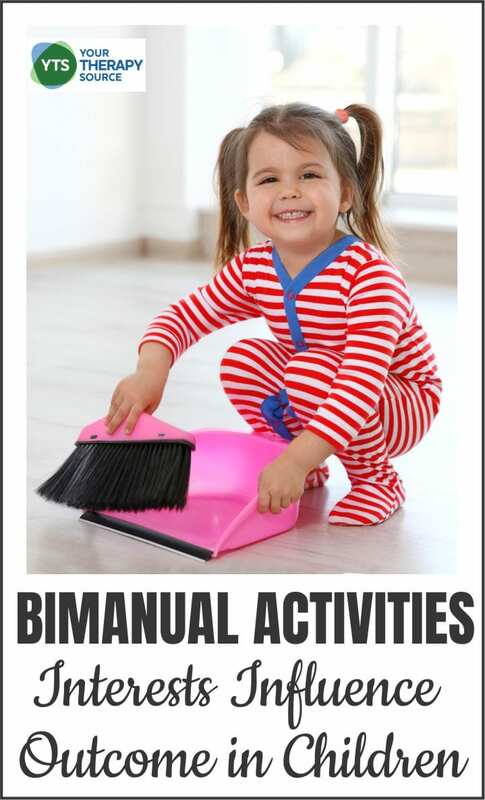 If you need more bimanual activity ideas, check out Therapeutic PLAY Activities for Children. 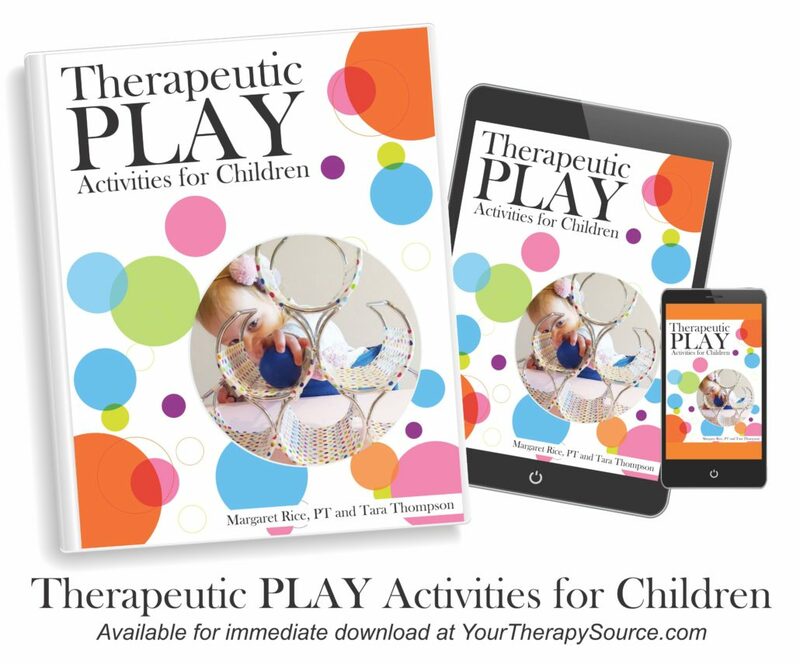 The digital download includes 100 play activity pages and 12 tip sheets. The play activities encourage the development of fine motor skills, bimanual skills, rolling, crawling, tall kneeling, standing balance and cruising with a strong focus on children with cerebral palsy. Bimanual activities are skills that we use two hands to complete. All children benefit from practicing bimanual skills to help develop coordination skills, crossing midline, and functional life skills. Children with cerebral palsy, especially hemiplegia, are often encouraged to participate in bimanual activities. Many times following a period of constraint therapy, bimanual exercises are recommended. This list of 50 bimanual activities of daily living makes it a little easier to facilitate these skills. Research in Developmental Disabilities published research on the benefits of structured bimanual skill practice. Twenty children with unilateral spastic cerebral palsy (CP) participated in the study in order to determine the importance of skill progression during intensive bimanual practice on movement coordination. The British Journal of Occupational Therapy published a research review to determine how bimanual therapy and modified constraint induced movement therapy or constraint induced movement therapy (CIMT) methods are used for occupational therapy home programs.